Fig 1 BS1362 fuse characteristics. What many people may not realise is that a 13A rated fuse is not designed to actually blow at 13A. In fact a 13A fuse will allow a current of 20A to pass indefinitely without blowing. If we look at the graph in Fig 1, it shows the operating characteristics for both 3A and 13A BS 1362 fuses. The grey shaded area is the point where the fuse is designed to operate. 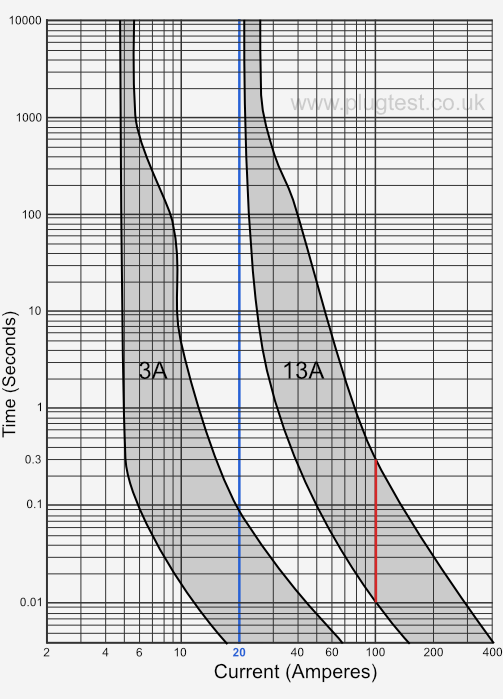 So for example, a 13A fuse will blow within 0.01 - 0.3 seconds for a fault current of 100A; shown in red on the graph. For a current of 20A, shown in blue on the graph, a 13A fuse will not blow! So why does a 13A rated fuse not blow at 13A? The wire inside a fuse heats up when a current passes through it. The more current that passes, the hotter the wire will get. If the current is high enough, the wire will melt and cut the power to the appliance. The rated current of the fuse, in this case 13A, is the current that it can safely pass whilst maintaining a low enough temperature not to overheat the plug. BS 1362, the British Standard for plug fuses, specifies a maximum power dissipation of one watt when carrying the rated current. The actual current, where a BS 1362 fuse will blow, is about 1.66 times the rated value, so for a 13A fuse this will be 21.6A. Fig 2 Damage to plug caused by overloading. 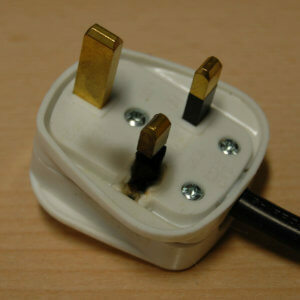 Fig 2 shows an example of an overheated plug fitted to an extension lead. This is most likely caused by the overloading of the extension lead. The fuse has sustained a current above it’s rated value, but below the point where it will actually operate and break the circuit. The fuse has heated up sufficiently to damage both the plug and socket. It is surprisingly common to find examples like this when PAT testing and I suspect this is a cause of many domestic and commercial fires. It also highlights the reason why the card with the wiring instructions should always be removed from the plug before use.